The official deadline for registering political parties for next year’s local elections in Iraq on 21 April 2013 expired last Sunday. The Iraqi elections commission continued to handle registrations on Monday and Tuesday but has now published a list that looks more definitive in that it does not any longer include the expression “registered until now”. 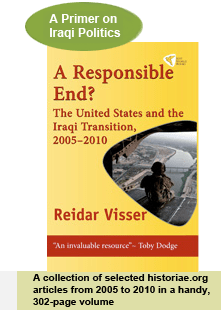 This being Iraq, it is hard to be certain whether this really is the final list, but it is certainly the most comprehensive account available so far and a brief discussion of these 261 entities can be worthwhile. It should be said at the outset that the publication of this list, while significant, is not a definitive indication of how the political landscape for the next local elections in Iraq is shaping up. The crucial stage in that respect is the list of coalitions, which on previous occasions has been published as late as one month before the elections themselves. What voters will deal with on election day, after all, is electoral lists, which can be made up of one party or several registered entities joined together on a list. A registration as a separate entity at this stage may well be nothing more than an expression of the hubris of Iraqi politicians who feel the need to have a political party of their own; as in previous elections a key question is the extent to which such hubris can be transcended for the purpose of creating electable lists and viable coalitions when the elections get closer. With regard to the registered entities themselves, they fall in three main categories. Firstly, there are all the well-known Kurdish parties. There will not be local elections in the Kurdistan Regional Government (KRG) areas proper on 21 April 2013 although they should have been held long time ago. Smaller Kurdish parties claim the two biggest Kurdish parties are procrastinating. Nonetheless, all of these parties are interested in local elections in disputed areas outside the KRG, and as on previous occasions, it is likely they may coalesce into a single Kurdish coalition to maximize the vote. Kirkuk is outside the KRG but was excepted from the 2009 elections due to disagreement about the rules for ethnic representation and is so far not scheduled to hold elections in April 2013. Secondly, there are all the parties that in one way or another form part of or have recently split from the secular, often Sunni-backed Iraqiyya coalition. Most of the familiar sub-entities of Iraqiyya have been registered, and there are new sub-entities as well. Well-known entities include the Hadba party of the Nujayfi brothers in Mosul and blocs associated with personalities like Saleh al-Mutlak and Zafer al-Ani. Some of the latest major breakaway factions of Iraqiyya are also running, including Wataniyun, Free Iraqiyya and the blocs of Ali al-Sajri, Iskandar Witwit and Kamil al-Dulaymi and the governor of Salahaddin. Also small sub-entities of Iraqiyya that have materialized very recently, possibly for the purpose of these next local elections, are running. They include blocs headed by Ahmad al-Masari, Talal al-Zubayie, Mustafa al-Hiti, Abdallah Hasan Rashid, Ziyad Tareq Darab and Adnan al-Jannabi. The party of Ahmed Abu Risha, the sahwa leader of Anbar, is also running. To some extent this Sunni/secularist fragmentation is understandable in the local election context, although it should also be seen against the backdrop of growing internal dissension in Iraqiyya over the past year. In an interesting expression either of chaos in the Iraqiyya camp or conceptual confusion regarding the difference between an entity and a coalition, Hadba and Wifaq are registered as separate entities but so are also the larger coalitions of which they sometimes form part – Iraqiyun and Iraqiyya. In the case of Hadba/Iraqiyun, the Nujayfi brothers have registered for one entity each, whereas with Wifaq/Iraqiyya, Ayad Allawi has registered Iraqiyya and left Wifaq to a lower-ranking politician. A notable omission so far is the Iraqi Islamic Party, whose gradual disintegration will be complete if they fail to present lists for the 2013 elections. Thirdly, all the familiar Shiite Islamist parties have registered as separate entities. This also includes several subdivisions of the Daawa party of Prime Minister Nuri al-Maliki, including Tanzim al-Iraq and Tanzim al-Dakhil. It is interesting that in addition to (erstwhile) Maliki ally Ali al-Dabbagh, Shirwan al-Waili is also running a separate entity. There are moreover two entities combining the names “knights” (fursan) and “the law” (qanun). Parties with names like these have previously been described as extreme Maliki supporters, and one of them is indeed headed by Abd al-Sattar Jabar who was also involved in the previous incarnation of the “Knights of the State of Law”. The Sadrists, whose participation was in doubt and/or fragmented in many governorates in 2009, are this time apparently running on a straightforward Ahrar list. The Shaykhis (Shiite sub-sect) of Basra once more mobilise under Amir al-Fayiz. Finally, in a parallel to the situation with respect to Iraqiyya, there is a State of Law registration in the name of Haydar al-Abbadi (presumably the coalition) in addition to the Daawa registration under Prime Minister Nuri al-Maliki. A key question is whether Maliki’s State of Law alliance will run its own ticket or whether it finds it necessary to create wider alliances in the many intra-Shiite contests in Baghdad and the southern governorates. The seat distribution list per governorate is also confirmed, with minor changes to the previous numbers from 2009. The next step now is candidate registration, with a 25 December 2012 deadline. Some kind of de-Baathification circus will most likely ensue, before the coalitions will likely form official lists early in 2013. One should remember that when all this is going on (and with UNAMI enthusiastically cheering as representative of the outside world), the Iraqi supreme court has reiterated its view that current electoral law is unconstitutional and void due to the seat distribution formula, and parliament has so far failed to pass the mandated changes. The court arrived at its interpretation after the ballots had been cast in the previous elections and the ruling didn’t affect the outcome of those elections retro-actively. This time, however, a warning has been issued. Absent the required legislative action by the Iraqi parliament to clean up the electoral law, the unclear situation could in theory be exploited by the powers that be if they are unhappy with the way winds are blowing in Iraqi politics come April 2013.